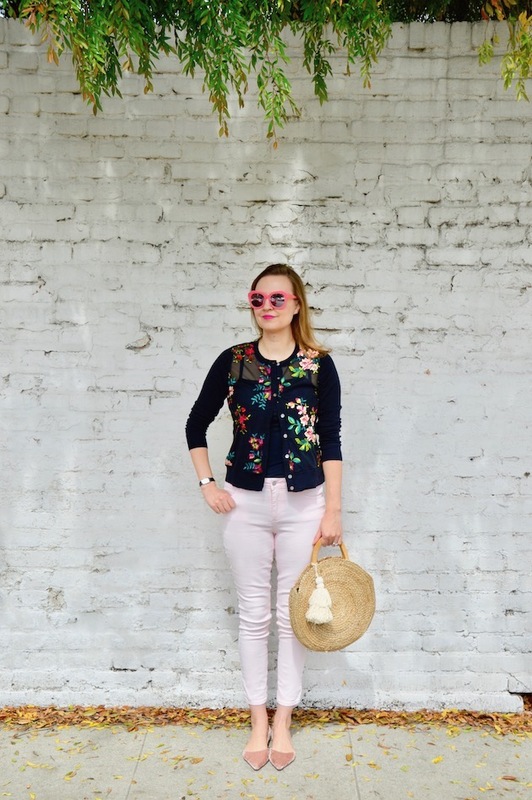 I have to admit that I've been buying a lot from Target this spring, but who can blame me when Target keeps coming out with cute things like this embroidered cardigan? 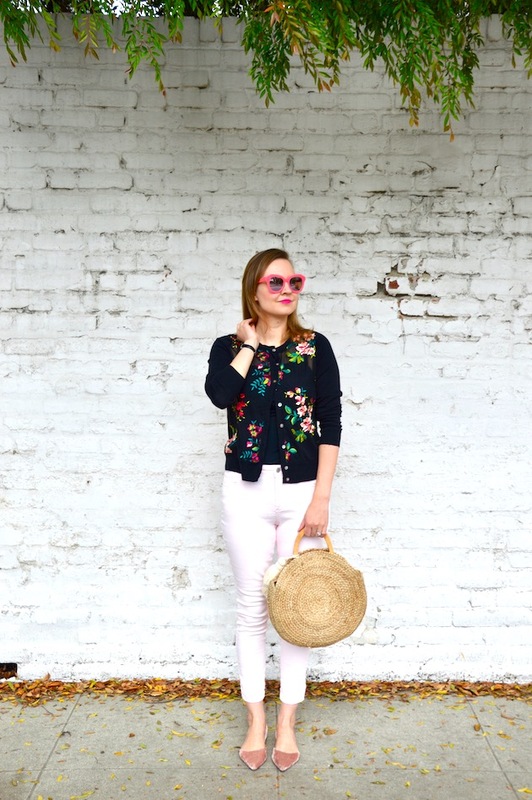 Apparently, I'm not the only one who can't resist the spring styles at Target because I wore this outfit a couple weeks ago to a Korean BBQ restaurant and when I sat down at our table, I failed to notice that the woman seated at the table next to me had the exact same sweater on! When I sat down, she said, "I like your sweater" and I replied "thanks" only to look up and notice that she was wearing the same one! I guess this is the official sweater of women who not only love shopping at Target but who also love Korean BBQ! Like the woman at the restaurant, I also paired the cardigan with jeans, however I decided to opt for something a little different than your standard blue jeans. 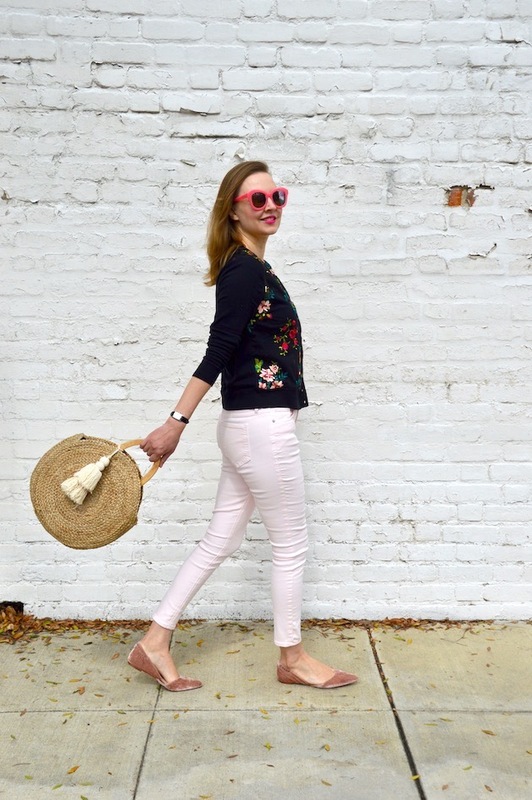 These pale pink "Rockstar" jeans are perfect for spring and perfect for my floral cardigan. They almost look white but there's just a hint of pink, which makes them very subtle and very versatile. So, as you can see, I wasn't completely twinning with the woman at the restaurant, as I definitely had my own unique spin on the cardigan! Gorgeous! That sweater definitely looks like something much more expensive than Target. I've been looking at a lot of the new things and need to go back to try this one. Love how you put it all together. The round purse is fun! Target has the BEST stuff lately!! And I have the receipts to prove it!! I love this outfit Katie, and I have a top like this, that I'll have to recreate it!! Oh my gosh that cardigan is so cute ! And I love how you styled it with the bag! You and the other lady have great taste in 1)amazing food and 2)cardigans! 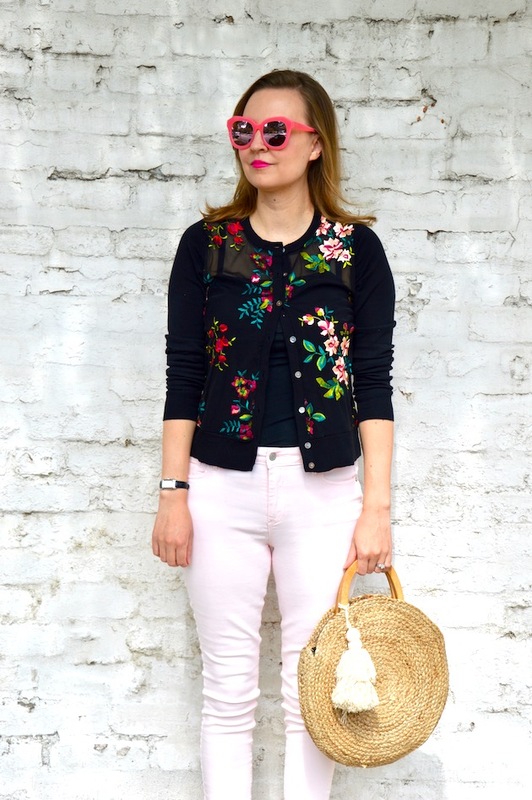 Such a cute springy outfit! I hope you'll add this pretty outfit to On Mondays We Link Up! Oh my, this look is so pretty. And I looove that bag! Well it's no wonder you're twinning because that sweater is beautiful! I love the embroidery and you styled it perfectly!